I know you are very busy with other issues at this time, but I would like to address an issue that has yet to be properly fixed. Beyond the fact that there are many other factors contributing to the downfall of this city, why has it taken so long to start the reconstruction on Flint’s water system pipes? It has been almost 2 years since the huge epidemic and I have yet to see much progress being done. Although they have fixed over 2,000 of the city’s pipelines, there are still over 16,000 others that are “scheduled” to be done by late 2019 – a CNN report states. During the past few years since the crisis was brought to public attention, residents of the area have been subjected to use bottled water; Used for cooking, cleaning, bathing, and brushing your teeth, bottled water has become a new “survival tool” of a person’s everyday life. Also infections, rashes, hair loss and irritation of the skin, are a few side effects of the poisonous venom we once called water. Not only are the people outraged, but saddened as we are “forced” to live in such conditions as these. Named a racial genocide (Michael Moore ~ HotAir archives), residents such as Moore want those responsible to be held accountable. Not just given a slap on the wrist, but punished for their crimes against an entire city. There are some who claim there isn’t anything wrong with the water, yet they haven’t experienced it firsthand. I feel that there can be other changes made in order to uplift the community, other than informational meetings and water distribution sites. Housing should be provided in a different community for residents, while their area’s pipelines are being fixed. Also money should be given to those who really suffered from this tragedy. Hospital bills, prescriptions, Medicare expenses, should be granted to the residents of Flint who really need it. A city cannot grow if it continues to live in the shadows of past mistakes. Venomous Water by Jalyn is licensed under a Creative Commons Attribution-ShareAlike 4.0 International License. I agree that this is an important issue, and the fact that it still has to be is shocking and almost embarrassing. The Flint Water Crisis no longer feels like a crisis — it’s just a reality people have had undrinkable water since early 2014. It may be that the scariest aspect of this now is no longer just the contamination itself, but the complacency of everyone involved. I agree that work to help flint trailed off to a minimum as soon as media attention moved elsewhere, there needs to be a continuous effort to change the pipes and restore the quality of water. I would ask, what do you think should be done? What steps could be taken to do this? I completely agree that the people who caused this mess should be held accountable. For too long those in power like politicians have gotten away with careless and costly decisions they made which hurt many other people. 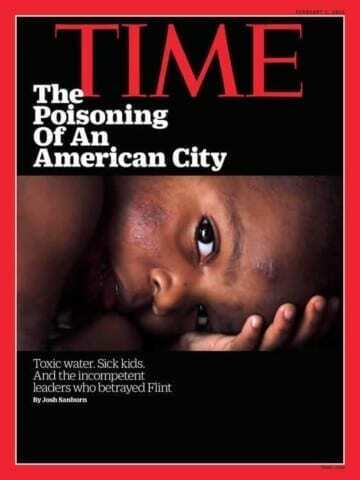 Something should be done about the Flint water issue and it should be done now. Hi Jalyn, I found this very intriguing and compelling, that thousands of people have no potable water or normal water and yet we don’t hear about it. This issue is extremely important and we all need to speak up and get some help for the people in need for healthy and safe water, cause water is the source of life. Thanks for sharing this with us and raising awareness. I found this to a very interesting issue that doesn’t seem to be talked about very often. This is an issue that, while it may not effect a huge amount of people, it is still a very prevalent issue for those it does effect. I liked the way you explained your point of view on the subject and expressed your feelings on the topic.